Immunohistochemical staining of human heart with Rabbit anti APAF1 (AHP487). Rabbit anti Apaf1 antibody recognizesApaf1 (Apoptosis protease activating factor 1), the mammalian homologue of the CED-4 cell death protein in C. Elegans. Apaf1 binds to cytochrome C and caspase-9 leading to caspase-9 activation, resulting in the beginning of the proteolytic cascade characteristic of apoptosis. Apaf1 can also associate with caspase-4 and caspase-8. 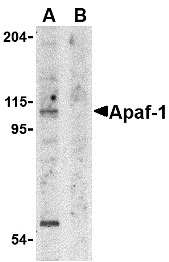 Rabbit anti Apaf1 antibody (AHP487) recognizes a ~130 kDa band in western blots. Antisera to human Apaf-1 were raised by repeated immunisation of rabbits with highly purified antigen. Purified IgG prepared by affinity chromatography. Synthetic peptide corresponding to amino acids 12-28 of human Apaf1. Zou, H. et al. (1997) Apaf-1, a human protein homologous to C. elegans CED-4, participates in cytochrome c-dependent activation of caspase-3. Hu, Y. et al. (1998) Bcl-XL interacts with Apaf-1 and inhibits Apaf-1-dependent caspase-9 activation. Proc Natl Acad Sci U S A. 95 (8): 4386-91.